For first time in Japan! 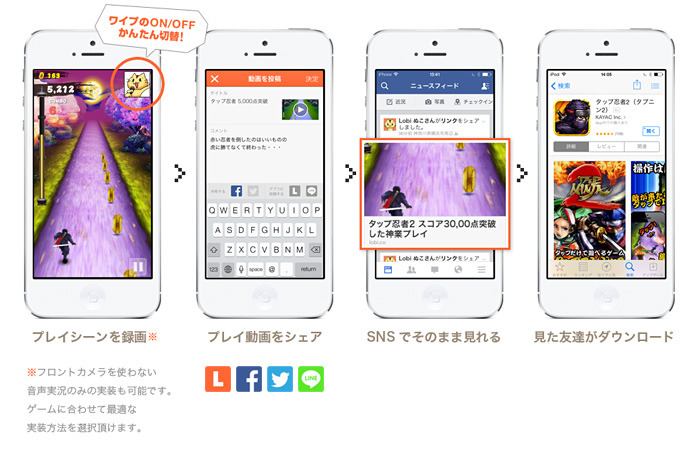 Allowing on-the-spot recording of smartphone game screen and sharing on social media! Lobi – Chat & Game Community operated by KAYAC Inc. started offering on January 31, 2014 “Lobi REC SDK” (free of charge) for on-the-spot game recording supporting smartphone game apps. Lobi REC SDK allows users to record the screen of a game in progress on smartphones. With the SDK, users are also able to add live comments while playing. The videos of recorded games can be shared on Facebook, Twitter, Lobi, and other social media sites. Lobi REC SDK is available as a free download for corporate and personal users on Lobi’s developer site.